Before carrying on with the notes on this particular pair of shoes, boots, please consider the boots made last June – Foot Wares. Foot Wares were the first foray into making a proper leather shoe or boot, and the pair presented here followed. The notes on these new boots are somewhat endless, so please consider Foot Wares as a preface when things get hazy in the text. Like always, some of the procedures used in the making of the old pair worked well enough to repeat again, and some of the procedures were inadequate. To sum it up, the Foot Wares fell short in their materials, their attachment of lining, their attachment of sole (both the stitched mid-sole with the upper, and the glued sole with the mid-sole), and the way in which the leather was stretched. Why the materials used were not adequate is because the outer was rawhide, which is much too stiff. The stiffness of the material created problems in stitching the shoe, and shaping the shoe. Also, the rawhide has one side that is very rough, thus you have to consider which sides are mated together and whether or not glue will be involved. Gluing the rough side did not work out well (as you will see in the notes of the attachment of the sole), and this roughness can not be sanded smooth which you could do with a vegetable tanned piece of leather. On the inside, the lining was a mix of felt and chrome tanned leather, which simply put, was not ideal. It was only placed in strategic areas instead of lining the entire shoe, and it was not properly integrated with the “welt” of the shoe, thus on the inside it was not a tight finish. There was also problem area’s with the Chrome tanned leather used on the heel cups where it stretched and resulted with a bad match. Lastly the heel cups were lined with a piece of rawhide just behind the heel, which became like a concrete wall, far too stiff for comfortable wearing, vastly prolonging the break-in time. 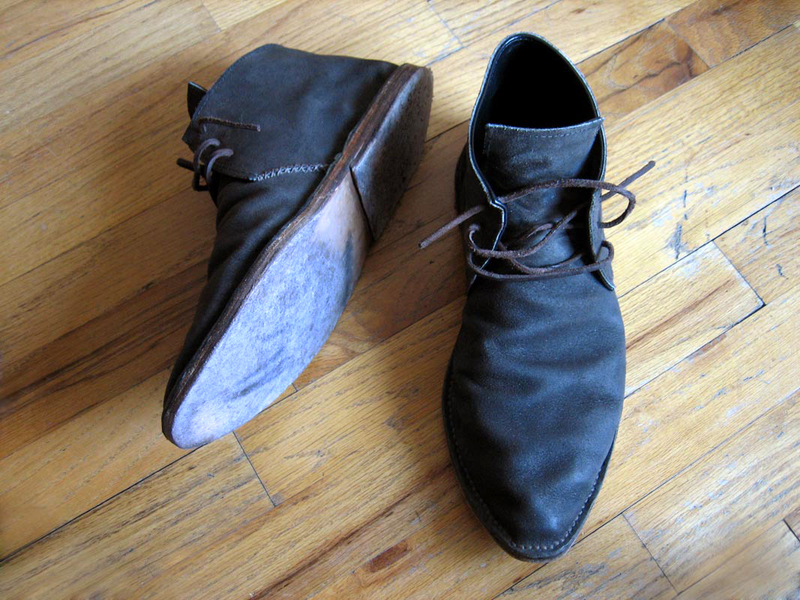 Why the attachment of the sole was insufficient is because the boots used a rawhide piece for the mid-sole (fuzzy side being the side to receive the glue), and low-quality glue, which paired together meant the leather out-sole simply would not adhere properly. As stated before, this was a total oversight, and rawhide was used to cut down on costs, but it is obvious now why rawhide is so problematic in so many areas. And, finally, why the stretching process did not work out is because A) stretching the rawhide was done afterward B) stretching rawhide is not exactly using the materials accordingly, although rawhide has a good amount of elasticity, it is also unpredictable/temperamental in such an exacting application C) no shoe last was used & D) dry time did not contain the proper variables to compensate for the strange combination of materials. Also, because the shoes were stretched at the end of the making process, it meant dunking the entire shoe (this was a horrible and naive decision), which in turn meant the semi-outsole that was a piece of vegetable tanned rawhide (placed between the rawhide insole and the rubber outsole) soaked up a bunch of water with little surface area exposed for it to dry out efficiently (i.e. only the edges of this section of the sole are exposed so the water logged piece was very slow to dry). While this may sound dismal, there were also a lot of successes, and processes learned, to compensate the pitfalls. And as can be seen on this post, the learning curve was steep and quick. Right from the get-go there were many obvious changes to be made. Where to start with all these alterations is difficult, so please bear with us, and take the order of communication with a grain of salt. The following explanation will hopefully work in a layered and diagrammatic way working from the outer of the shoe down and through the sole. Beginning with materials. No more rawhide was the first rule. Instead the goal would be to find a purposeful leather, which is softer and easier to work with, and most notably would accomplish one giant task: making a shoe-sans-last, where the activation of the shoe (i.e. with the human foot) would determine & form its shape. The material chosen for the outer was a bonded leather (it looks and feels similar to Nubuck). The fact that it is bonded leather is only a coincidence, what mattered was that it had the right density, and resisted tearing (for now we will bypass the overall aesthetic of the leather chosen). The tearing is for obvious reasons, but also because – logically thinking – the tear factor would have some affect on the acceptance of stitching. The rawhide, when hand-stitched seemed to have trouble healing up around the newly poked stitching holes. Thus these holes had a heavy and undesirable character about them which lead to concern about the structure of the shoe. With the new leather, it seems to rebound from the initial force of the awl and keep the stitching, with the materials, more like a single system (questionable observation albeit). This leather was also preferred because it was not too stiff, and also not too soft, therefore being structurally sound but also soft enough to conform to the foot without having to sustain great aches and pains. Lastly, this leather, since it is actually processed, is quite uniform in it’s grain literally and aesthetically: the rawhide was very inconsistent, which made it difficult to predict where and when there may be issues with uniform stretching/folding/forming. Then we have the lining: unlike our Foot Wares which had two different types of lining, lining which essentially draped into the shoe, these boots would have one type of leather, and it would be fully integrated into the “welt” of the sole with the upper when stitched down. (somewhat) Ironically enough, the leather chosen to line the shoe is probably (next to the sole pieces) the most costly leather used. This is for good reason, and came with great results. What we used was kidskin, this is the skin of a young goat, and presumably vegetable tanned. Why kidskin is used so widely and was a good choice in this application is that it is thin, has a very consistent grain, and is also very stiff for it’s weight. So sewing it in the areas around the heel and tongue pieces is much easier than the stretchy chrome tanned leather used last time around. And lastly, it looks great, is very breathable, and allows the foot to slip into the shoes with ease. After the upper materials were chosen it was time to consult the sole: this called for three separate pieces. The mid-sole which would have the upper (including the kidskin lining) stitched to it, was your average middle weight vegetable tanned leather, just stiff and heavy enough for durability’s sake, but also friendly enough that the hand sewing was not an absolute bear. After this comes a much heavier piece of sole specific vegetable tanned leather. This piece would be glued to the mid-sole, protecting the carefully sutured hand-stitches. And finally a heel piece, made from yet an even heavier piece of leather than the sole, heavy enough that a band saw is used to cut it. At this point we will switch gears from the materials used to compose the shoes, to the materials used to hold those very materials together. This category basically falls into two places, glue, and thread. Both of which were inadequate the first time around. Starting with the thread: there are two different threads used for this system of construction, one for the upper and one for the attachment of the upper to the sole. For the upper, the stitching used to attach the lining on Foot Wares was Coats&Clark “button and carpet thread”, which for all intents and purposes worked fine (the extra weight of the thread held up to the rawhide with vigor). However the story begins here: when constructing Foot Wares Coats&Clark “button and carpet thread” was also used to stitch the upper to the sole. This did not work. It was fully capable of stitching and creating the seam, but what could not be predicted was it’s inability to create a tight enough stitch in such an extremely worked area. 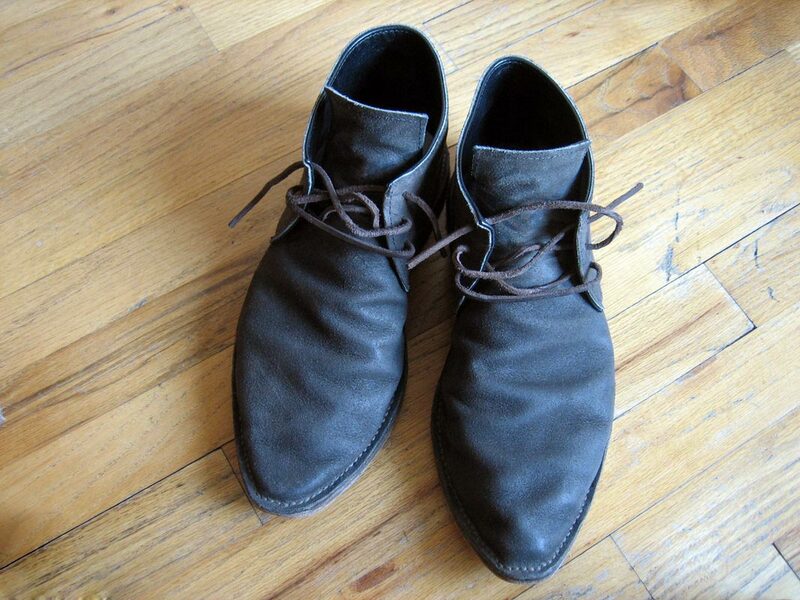 After wearing the Foot Wares for some time, we noticed that the upper would shift independently of the sole. This, as much as we can figure, is due to thread tension and thread weight (both having affect on the other). Although the thread tension on the Brother can and could be set pretty high, the thread which could withstand this pressure will not run through the hook. But, even this is hypothesis. After much consideration it was decided that the only right way to do it would be to hand-stitch the sole with the upper using a much heavier waxed linen thread, one stitch at a time using a leather awl. This is the jump and the leap between the two shoe sets. On the Berlin boots, the upper is pulled to the sole one stitch at a time as tightly as possible, with the waxed cord creating a high level of friction to keep things tight and protect the cord later on from outside elements. And then moving backwards again, the upper is stitched on the machine, however this time using Coats DB-92 polyester thread. Quite honestly this entire post could be written (and still at great length) just discussing the thread by itself. 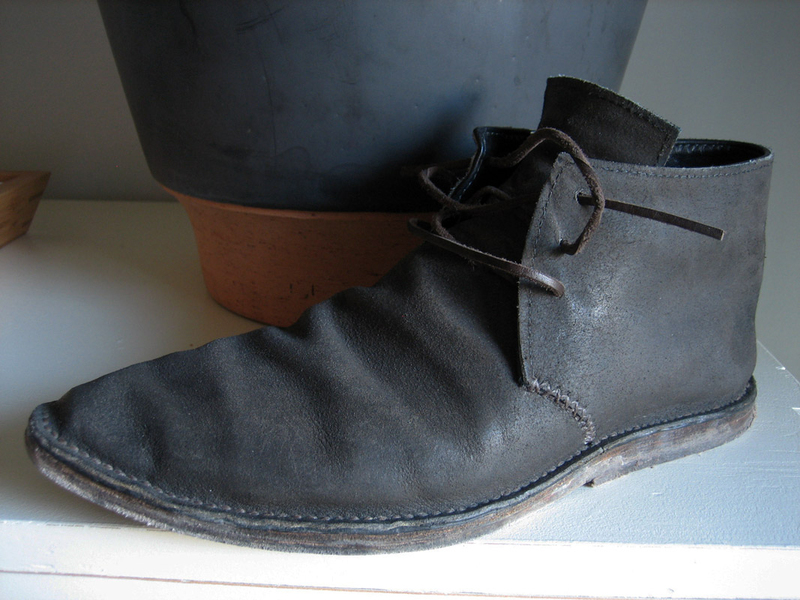 Another note is that (looking into the future) we went back to the Coats&Clark “button and carpet thread” for generations 3 and 4 of this shoe (for the upper only) and it was more difficult to work with than the Coats DB-92 polyester thread. The DB-92 thread seems to slip and pull much more smoothly through the lighter leathers, whereas the “button and carpet thread” was full of friction and created unnecessary randomness. As has been stated in the past, the “button and carpet thread” has it’s own will, which is proven time and again to be quite a thing to test. Moving onto the glues: this time we used two, one of which was good ol’ Elmers white glue with the orange cap. The Elmers was used to make little connections here and there for short hold, and then also to semi-laminate the kidskin lining to the bonded-leather upper (after they were stitched together). This was done to keep them as closely fit together to make sure when the hand-stitching began, they would both end up in the welt. The other glue used was a huge trade up from the PowerPoxy: it was now time to use a much more proven agent, Barge Glue. Barge Glue was highly recommended by some friends and some professionals alike, so the plunge was taken. Barge Glue uses a photochemical process to create a very strong, instant, and lasting bond. It is especially useful for leather, wood, and rubber, thus making it an ideal candidate for shoe construction. 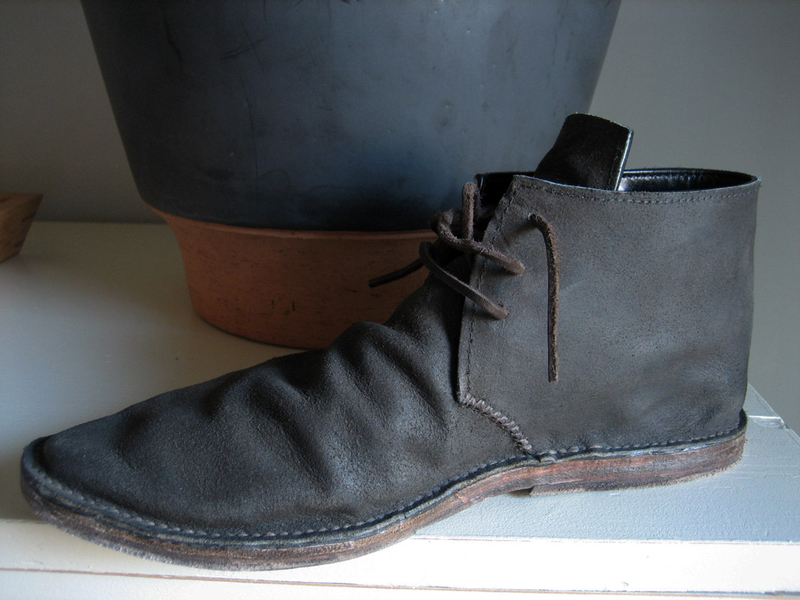 For the Berlin Boots, attaching the mid-sole to the sole would no longer be an issue. The upgrade in glues and thread was a huge benefit, it’s hard to say what will replace this method in the future, so expect to hear more about this topic in later posts. With the materials explained: the next topic will open up the steps taken in the construction of the Berlin Boots. The very first consideration had to do with the shape of the shoe being accomplished without a last. This leads to two thoughts: one is that leather will inherently stretch, so it is possible to make a floppy structure of leather which will become the shape of a shoe/foot with time – and two, this floppy structure should actually be quite taught (not floppy at all when initially on the foot) for the initial fitting. The first step would be to get the pattern figured out, taking as many ideas from the Foot Wares as possible in how to tighten things up to achieve a better fit. Of course, this is a job for some Weathermate – and we begin. Knowing that the Foot Wares were too wide, and round, throughout the shoe meant taking in all aspects of the perimeter of the sole (base, footprint) and then building (up) the upper’s pattern from there. This taking-in was theorized to accomplish more than one thing: obviously the fit needed to be closer to the foot, and after great lengths of thought enacted the realization that because the sole is stitched to the upper, with the upper flanging out onto the sole, we would have to make an exaggerated attempt at reconstruction to curtail this flange to keep the boot more compact. The idea being, once the perimeter of the shoe has been decided, we do not really want to add seam allowance on top of that. The sole should (in the end) be the same circumference as the foot, or close to it. This would keep the foot more secure in the shoe, and even though it sounds like overkill in the opposite direction, that is what is needed for this application. Needless to say the difference in pattern between the elder shoes and the younger ones is vast. The Berlin Boots are shorter, and much narrower throughout. Also there were great leaps made in the techincal aspects of the upper, which there are numerous factors for – all of these in the end – coming together to achieve a common goal. The main alteration of the uppers has to do with this never-going-away idea of building the shoes without a last. Therefore, unlike the Foot Wares where a large channel was cut to allow the tongue of the shoe to bend up easily, thus allowing the foot to enter without trouble: for the Berlin Boots this channel would be reconsidered. Also the shape of the fore parts of the heel-cup (now) have a backwards sweep coming back at the midpoint of the front of the cup. Lastly the pattern is stitched together with the heel-cup wrapping around the toe section, unlike the Foot Wares which employed the opposite placement of the toe-cup wrapping the outside of the heel-cup. With all these changes the overall aesthetic changes drastically, but more importantly the foot is completely covered, and this is all made possible by the change in leather. If this pattern were made with rawhide, the chances of getting your feet into the shoe would be slim. Of course the fit is still tight around the foot, and the new style greatly increases part of this friction – but that is the goal – taking some amount of turbulence and letting the leather with the foot reach it’s own singularity. With the pattern devised, all cutting (clicking) of materials was completed next, being very careful to not make any mistakes, as leather can and will show just about any glitch (which means starting over). After everything is cut out there are anywhere from 5 – 7 separate pieces per shoe to work with. Generally the perimeter of the mid-sole is part of these pieces cut ahead of time, but in later boots (no posts on these yet) we’ll omit this trimming in favor of a loose trimming to be cut tightly to the proper crop later, the loose trimming acts/gives a bit of extra leather – much like bleed on a printed work – for paper, but for the sole on some shoes. The whole sole (both the mid-sole and the out-sole) however, is (are) always trimmed at the very end so that they (the cut perimeters of the mid and out – soles) can meet up exactly with each other to create the appearance of a seamless-complete-outer-sole. Therefore, not including the sole pieces (combined or separate) four of those cut pieces are for the upper, which consist of the lining and outer of both the heel-cup pieces and the toe pieces (what will become the quarter section and the vamp). *(out-take) The steps taken to activate it are very simple, brush on the glue to both pieces faces to be met, let dry for about 20 minutes (Barge claims to let it dry between 4 minutes and 4 hours, 20 minutes seems to be just right), and then press together. Because Barge Glue is pressure sensitive you can either hammer the pieces to create a stronger bond, or put them in a vice and clamp them together. However, because these are shoes, clamping them in a vice would be cruel, so the hammer is used to tap the pieces into place, and then the perimeter of the sole is pinched (every inch of the way) all the way around the sole.